Last week, I conducted a little study of our mail and wrote down everything we received Monday through Friday. Ready for a voyeuristic view of our mail life? Here you go. I really don't think those numbers look too bad. What do I do about it all? We recycle and I think that a lot of our weekly recycling is mail garbage. 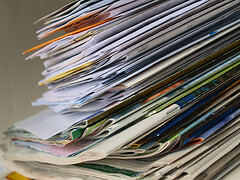 Opting out and going paperless can make a big difference in how much waste your family has every week. We've done a lot of work lately to cut down on our mail. For the catalogs we're not interested in receiving, I email to unsubscribe when I think of it. This really helps cut down on the paper waste and, really, the temptation to buy more stuff. You can also check out services offered by Catalog Choice. We've also both renewed our opt-out status on pre-approved credit offers-- I recommend you do the same. The things I mentioned help with the amount of mail, but how do you manage the mail that isn't junk, the mail that you need? I can't really say I need my student loan statement or bills, but I guess I have to pay them. I process our mail as soon as it comes into the house. There are 4 options for our mail: 1) action items that get attention after Goose goes to bed, 2) items that are informational and need to be filed, 3) items that need to be shredded immediately (credit card offers, anything with our names and addresses that we won't file), 4) items that go straight to recycling after they're read. Without curbside recycling and my trusty shredder, I don't know how I would process our mail. How do you handle your mail? Are you trying to go paperless on as many things as possible?